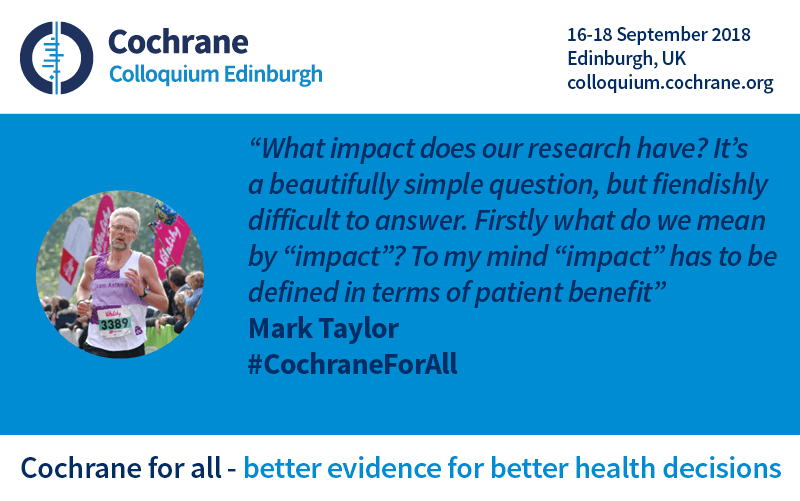 André Tomlin (@Mental_Elf ) from The Beyond The Room Team for Cochrane For All at the 2018 Cochrane Colloquium interviews Mark Taylor (@MTaylorOxford), Head of Impact for the Central Commissioning Facility of the National Institute for Health Research, about research impact, his own experience of multiple sclerosis and how Cochrane can involve patients in their work. Welcome back to Cochrane For All, everyone. I am with Mark Taylor. He is the Head of Impact for the Central Commissioning Facility of the National Institute for Health Research. I got it out in one breath. Welcome, Mark. How are you doing? I am fine. It’s been an exciting time so far, I think. You’re giving a keynote later on today. Is that right? Tomorrow morning, yes, so I have another night of nerves before I get up in front of people. I have done the slides, which, for people who know me, is kind of unusual. So there’s every chance I might end up ignoring them anyway. Yes. I saw you speak in Oxford, a few months ago and it was a really good combination of your own story and your, kind of, professional situation, and your kind of vision for where research should be going. Is that what you’re going to be doing here at Cochrane as well? Yeah, I think so. I do a riff on cognitive bias. We all have them. We all have unconscious bias and part of my viewpoint is driven by the fact that I’ve had multiple sclerosis for fifteen years, and I have other multiple morbidities, comorbidities as well, and therefore there’s a level of patient’s impatience, if that makes sense, when it comes to seeing research get translated into practice. So a lot of the stuff that I’ve been looking at, when it comes to impact assessment research that NIHR fund, has partly been driven to try and get the patient viewpoint, if that makes sense. Yeah, absolutely. So, what are the problems? We know the problems in terms of, you know, the gap between research and practice – that hasn’t seemingly closed in the last, kind of, twenty or thirty years. In mental health, it’s still seventeen years. That’s what it was, when I started working twenty-five years ago. But I guess, there’s also problems about the way we actually measure the impact of research. How do we do that currently? Sure. Well, it’s quite difficult because research is so broad. I mean, let’s take NIHR. It’s a 1.1 billion pound a year funding organization. It might even be 1.2 billion pounds. If it only funded one thing in one way, it would be relatively straightforward to come up with a very dull logic model and then talk about what impact might occur and how you can measure it. But that’s not what NIHR does. It spreads its money broadly: world class research but anything from a 100,000 pound feasibility study for someone new to research, to a 100 million pound, or more, five-year infrastructure grant between a major university and a major hospital and, as such, it’s pretty much impossible to say, that’s the way you look at impact. And if you try to do that, you’d end up with a sort of meaningless number. “Research impact this year is 4.5”. It’s too complex to say it’s going to be a single thing. So, the point is to try and promote people to ask the right questions depending on what research they’re doing, and the pathway they’re trying to actually change within the NHS. And that’s a much better way of looking at it, I think. Do you think the current system is stacked against researchers actually adding to knowledge in such a way it benefits patients? Err. I don’t think it’s stacked against that. The issue, I think is, there’s what the culture is in the organizations that undertake research, and the culture of the funders as well. There is a danger of a closed loop conversation between funders and fundees that may touch on patient requirements and patient viewpoints but actually is a way of doing no more than ticking boxes. That’s not because anyone’s evil or stupid but it’s what we all default for. And we need to think in a far more broader term. So NIHR has spent a lot of time and effort on patient involvement. Simon Denegri and Zoë Gray at INVOLVE (www.invo.org.uk) do an awful lot of work on this and Simon, particularly, is a real figurehead in this area. We have the James Lind Alliance (www.jla.nihr.ac.uk) to get the patient viewpoint in prioritizing what sort of research that we do. There’s a lot of work that will continue in that but I think when it comes to working out what the impact is, we need to ask the patients again. What do they think success looks like, for them? Taking into account, as you say, on average, and it is a very broad average, it’s seventeen years for research to get into practice, do we need to ask patients earlier on, well what do they think? What would they hope for, if the research were successful in terms of their pathway? And at the end, when we are lauding this fantastic piece of research that’s got into practice, can we get the patient viewpoint about whether it really has…has it touched their lives? And can we be honest? And this is my MS hat really coming through, that actually a lot of chronic condition effects are going to be outside the health service. So we know very broadly that in my condition, multiple sclerosis, actually two-thirds of the effect is outside the healthcare service; two-thirds of the cost is not going to fall on the NHS, it’s on social care, it’s on family. You know, I did some very basic maths a few years ago and I talked about this in Oxford. MS has cost me a six figure sum in lost earnings. That’s never going to be caught in a NICE guideline and, by definition, is never going to be caught in many systematic reviews but actually when we’re looking at the success of MS research, do we need to look beyond changes in the NHS? I think we do. Do you think we are funding the right kind of research? There was a really interesting tweet this morning, which was asking about what sort of research policy makers rank highest. And various conversations on twitter about, you know, obviously economic analysis at the top and then RCTs and then sometimes they’re interested in qualitative stuff. What was interesting, was people saying actually it’s the politicians and policy makers that are often persuaded to do something, to fund something, to go in a certain direction, by the stories, by the patient stories. Do you think we’ve got that combination right? No, I wouldn’t…It’s neither right nor wrong. It’s an evolving story at the moment. Decent impact assessment is narrative with numbers, not numbers with a bit of words at the end of the day, as I said, otherwise you get driven by how much money something makes, the all tech transfer conundrum in that sense, rather than what actual effect it’s had on patients. So, there has to be a storyline to all this. Whether we’ve got the balance right is, I think, a moot point. Most charities, as part of the AMRC (the Association of Medical Research Charities) are at least in part led by the patient cohorts they represent. So I had a conversation with the Head of Research of the MS Society, Susan, last week or the week before, about the fact they are very keen to do more work on say fatigue, which is a particular problem with people with MS. And they are trying to work out a way of getting better application for research in that particular area and getting better ways of judging that sort of research they’ve done so far about what the impact actually is – to break that closed loop of funders and fundees, which sort of but don’t really touch on what patients think is important. As I said, no one’s doing it deliberately, it’s just very difficult to get the patient viewpoint , I think. Most conditions vary enormously. You know, MS is a classic case. I count myself exceptionally lucky after fifteen years of being extremely mobile and yet it’s not unusual for some of my tribe to be mobility restricted very quickly. People talk about four types of MS. I think there are four thousand types. And therefore, trying to capture what’s important to a particular cohort, is close to impossible. We shouldn’t not try but we should be aware that actually, many times,” the best is the enemy of the good”, and let’s try and get something that works first, and worry about the rest later. You’ve spoken about Simon Denegri’s work and his colleagues at NIHR INVOLVE, amazing work. This is a Patients Included event here at Cochrane. 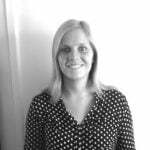 What is your perception of Cochrane and the collaboration and the network internationally in terms of how they involve patients in their work? I think the fact that they’ve realised they’re missing a trick, missing a beat, is a marvellous step forward: the fact that it is a Patients Included conference and that there are a lot of discussions about how we might do this. The session I’m talking about tomorrow about Partnership for Impact and my colleagues there, and the fact that it has taken centre stage, is a great first step. The key though is to keep going. This is part of, I would imagine, a long-term cultural change programme. It doesn’t happen overnight. There will be moments it won’t work at all and the issue is not to stop when it gets difficult and to keep going, to listen and to learn, and ironically, maybe sit down now and work out what’s the impact of having patients involved in Cochrane that we would expect to see in ten or fifteen years’ time. Maybe ask patients what they would hope to see. And then in ten or fifteen years’ time, you can then work back to see, did it actually have an effect. That would be my one piece of advice. Thank you, Mark. Brilliant stuff. Good luck tomorrow.